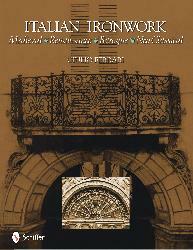 Italian ironwork from Roman times, through Medieval centuries, and up to Neo Classical designs of the early nineteenth century comprise this collection of 100 photographs from Italian sources. They depict trellises, grilles, gates, fencing, household lighting, fireplace accouterments, and door hardware that will inspire today's designers. Their origins in hill towns of Italy are recorded for many images. This is authentic ironwork for contractors, decorators, and homeowners to enjoy.